This was clearly a premeditated plan by the KKE as it was repeated in less dramatic form elsewhere in Greece. 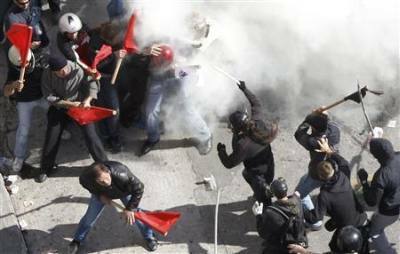 In Ioannina, PAME threatened and beat up protesters who were opposed to them and who had to reach government buildings. On Crete, members of KNE (the youth wing of the Communist Party) threatened protesters with sticks, outside the city hall. In the course of the demonstration a PAME member, Dmitiris Kotzaridis, died due apparently to inhaling police teargas (he had a history of respiratory problems). This did not stop the KKE from claiming he had died as a result of a blow to the head from a rival demonstrator. Indeed their own press release about the incident is chillingly reminiscent of the sort of Stalinist propaganda that accompanied the Show Trials and the way the Stalinists operated in Spain in the 1930s. Statement of the Press Office [of the KKE - ed.] concerning the organized murderous assault against PAME’s rally in Syntagma and the death of the Trade Unionist of PAME Dimitris Kotzaridis. On this occasion organized groups with specific orders and anarcho-fascists unleashed an attack with Molotov cocktails, teargas, stun grenades and stones, in attempt to disperse the majestic rally of workers and people in Syntagma Square and especially in the area where PAME was concentrated. … The hatred of the hooded ones against the labour and popular movement and PAME expresses the fury of the forces which serve the system and bourgeois power. The government has massive responsibilities for this. "Many reports claim...", "A Greek source tells us...." Whose reports ? Which source ? Which organisations in Greece do most to organise workers to resist capitalism ? Certainly not the KKE who are inside the system and this stunt was all about preserving that position. The sources used are in the article should you care to look. You are quick to leap on any criticism of the KKE, taking no account of the activity of provocateurs intent of sabotaging the united struggle of workers in Greece. You should visit the website of the Communist Party of Greece and see the video filmshow, in which hooded baton-wielding thugs are seen attacking demonstrators of the KKE, and read the statement of the General Secretary of the KKE. In any case, presumably steps have to be taken to organise KKE demonstrations to acheve impressive impact, so that miscellaneous maverick factions have had to be disuaded from deliberately interfering with the orderly well-arrayed advance against government forces. ICT should stop wittering in diversionary confusionism, fed by capitalist reaction, and get on the side of the organised working class. There is a long history of antagonism between anarchists and the KKE in Greece and the KKE obviously intended to use this to stir up a fight. It was their provocation of not only surrounding parliament but also preventing others walking by on the pavement that started. As to thuggery we think the anarchists were stupid here to respond to the provocation but you can go to any number of sites to see videos of the thugs of the PAME with blood on their batons. They had prepared this. But the first people to take offence were the liberals of the "I don't vote" movement. We printed the statement of the KKE to show what hypocrites they are. Going to the KKE site is a bit like asking Stalin for his version of how the show trials were going. The KKE has now split the movement against the austerity package thus making it easier for it to go through. Some defence of working class interests! PAME, the KKE's union does have lot of workers but as long as they are organised under the KKE banner they are lost to a revolutionary perspective. The TUC are the organised working class here but we don't support them either since they also organise the working class for capitalism. Cleishbotham's array of allegations have been noted, with its reference to 'any number of websites', maybe of all manner of non-party organisations. But what do the vast majority of workers in Greece think of the KKE ? Please consider that. And don't forget which organisation organised the fight-back against nazi invasion and all the following struggles against the rule of capital and imperialism. 1957 was a long time ago, but while working as a volunteer digging a trench to bring water to a home for children from the earthquake high above the town of Volos, I visited the home of a Greek tobacco worker at Zagora, imprisoned on an island. I had been told of his plight by the organiser of tobacco workers in Liverpool. I went to Crete and hitched back via Turkey. I went to Greece and Crete again in the 1970s. No, I don't know a great deal about the internal situation in Greece today, apart from what I have read and seen on TV, but when there, gained a set of impressions of the life of poor Greek farm workers and stayed for a few days in Athens. The small boat taking me from Rhodes to Marmaris flew both the Greek and Turkish flags, which seemed advisable in the days of Makarios on Cyprus. Fortunately on my way to Zagora the group of anti-British youths who surrounded me didn't actually beat me up, whereas the family of the worker made me welcome. I suppose that having solidarity with Greek workers means respecting what they actually think and want, which remains to be seen, however many news reports are unleashed on us. Your arguments are as useless as ever. Your premise is that if a large number of workers are led into believing that some capitalist racket is a good thing then that proves it is a good thing. Rupert Murdoch (and a host of capitalist populists) would be proud of you. At least however you now admit that the "news reports" don't actually tally with your earlier uncritical defence of Greek Stalinism. Oh and by the way we have met and discussed with the KKE members here and though we have found them to be very nice people they do still believe that "Stalin was not really so bad" to quote one of them. Standing up for working people means standing for a consistent, long term, revolutionary perspective, not flip flopping from one ideology to the next. dktz says:" I suppose that having solidarity with Greek workers means respecting what they actually think and want..." If what they want is the Stalinist state capitalist solution to the crisis, then they must be crazy, and the sooner they get disabused of this idea the better. There is no nationalistic Greek, or Turkish solution to capitalism; nor should we emphasize solidarity with just Greek workers, as if preserving some Nation state and it's particular exploited class would get us anywhere! What we look for is Internationalism. Solidarity with the International working class; in it's global struggle against all kinds of capitalism, including the Stalinist type. That the KKE fought the Nazis, only shows what a bourgeois outfit they've always been. One branch of capital fighting another! Poor Greek farmers - like the rest of the world's exploited - will only find liberation when capitalism is totally destroyed, and communism built. The KKE have no interest in that. Responding to the previous two comments of 2011-10-30, 23:26 and 2011-10-31, 04:21, please consider how you would have felt if you had been living in Greece under nazi occupation. Would you have dismissed the KKE, fighting against the nazis, as a 'bourgeois outfit' ?! As for those KKE members in the UK who are quoted as having said that "Stalin was not really so bad", to the extent that Stalin was largely responsible for directing the Red Army, and as it liberated Auschwitz and drove the nazi forces back to Berlin, that has been acknowledged as 'not so bad' by millions of people, not only the KKE. Now I guess readers are about to get another lecture on the imperialist causes of wars. On that, it seems to me that as well as all the rivalry for markets and raw materials, an ongoing motivation for wars is the vast profiteering made by the various arms industries and arms traders, which seems to me to deserve far more attention by marxists today. Anonymous (who is, I think, an ICC sympathiser) states "That the KKE fought the Nazis, only shows what a bourgeois outfit they’ve always been." We think this is a poor argument or perhaps a poor way of putting an argument since we oppose equally all imperialist gangsters including those of the USSR. Our predecessors in the middle of the Second World War (1943) called for a fight against all the imperialist alliances equally and for an independent struggle for socialism (and some lost their lives to both Stalinists and Hitlerists because of it). Had we been in Greece we woudl have had an identical stand. But Dave have you so lost your moral compass that you are prepared to ignore the atrocities committed by Stalin (against hundreds of thousands of real communists in the gulags) just to extol the supposed virtues of today's Stalinists? The Red Army you mention would not be the same force that raped its way across Germany or subjected Poland, Czechoslovakia etc to the miseries of the police state as they looted their industrial plant? I suppose that the editor Cleishbotham is none other than Jock ? Please correct me if I'm mistaken. Responding to your comments in your first and middle paragraphs of 2011-10-31; 20:22, it seems likely that if you had been in Greece in WWII and had taken the stand you described, you would have been shot either by the nazis or by Greeks regarding you as a collaborator. If the nazis had overrun your UK home area, you would either have been shot by them or put on forced labour, until perhaps released from that by anti-fascist fighters, perhaps aided by soviet forces. Then, if you opposed being freed from forced labour, perhaps you would have been regarded as a fascist sympathiser and thus sent to corrective labour on a Scottish gulag !! Never mind ! No, actually matters were very serious for almost everybody snarled up in WWII and no joking matter. Your refusal to have anything to do with the various 'sides' in it is clear and understandable, but is also exclusivistly doctrinaire, reminding me of a comment made to me by a teacher when as a pre-conchie I was wearing the badge of the War Resisters International - "That's not much use when somebody is pointing a gun at you". Yes, I do flip-flop between schools of thought and find some of the non-theistic aspects of Buddhism personally helpful, even if that's not really what it is supposed to be about... Buddhists are a bit like the ICT, in that they (mostly) don't rely on theism, but on donations. And whatever you say about me, I'm not really a 'Stalinist', but every word is a generalisation, according to Lenin. When you wrote "or by Greeks regarding you as a collaborator" you meant the KKE. The Itlain equivalent issued death warrants against our comrades signed by Togliatti. But your fantasies about Scottish gulags don't seem to have taken the point that we are not talking here about hypothetical situations. Our ancestors did fight both sides in the Second World War on the ground in Italy in the name of proletarian independence. We are still here and proud of their fight. That is a fact. Sorry to hear that you had to adopt "Anonymous" due to the site logging you out. This is not the first complaint of this kind we have had so I'll pass it on to our webmaster. And apologies for mistaking your framework - my excuse is that the only "Anonymous" contributions we have been getting are from ICC sympathisers (who are generally a lot crasser than the ICC). I did not say that "it explained everything" though! I just wanted to distance us from a bad line of argument which I knew would be seized on. Jock, thank you for your comments so far. However, referring to that of 2011-10-31 23:40, surely fighting both sides in a war is a mug's game ? What do you do when one of those sides is attacking your family and or colleagues ? That is a dilemma for pacifists and communist-left internationalists. Do you stand by, because members of the SS might also have been members of the international proletariat (and/or Buddhas ! ), or open fire, or, in the case of a holocaust prisoner, leap and bite through an SS jugular vein ? (Not forgetting Gaza, either - Support Medical Aid for Palestinians.). Referring to your contention that I have lost my moral compass (2011-10-31 20.22), I have a collection of moral compasses to which I refer daily in random order ! Unfortunately when a ship is being tossed about in storms, consulting compasses is less useful than dealing with immediate concerns. Also, as a saying goes, 'you can't walk in a straight line when the road bends'. It's easy to slam labels on people and sets of thought. If it would console you to deem and dismiss me as an opportunist nihilist, go ahead. Even so, despite all contradictions and vicissitudes, it is probably necessary that workers of the world should unite, but that is an aspiration rather than a trend, even though revolts are evident in several lands in 2011. I think that interaction of this exchange of comments between ICT (Jock) and me has now exhausted any possible mutual usefulness, so, unless provoked, I'll give it a rest. Cheers. Dave. Jock, despite my stated inclination to desist from exchanging further comments with you/ICT, looking back over your own, now it seems to me that it would be useful to examine your contention of 2011-10-31 20:22 that (quote) "The Red Army you mention would not be the same force that raped its way across Germany..." (end of quote). Please would you explain what was your basis for that remark ? It is easy to guess that anti-communists would enthusiastically support it, with or without any evidence. If you are going to attack the whole of the Red Army in that way, you had better present evidence to the working class. Read Anthony Beevor's book and then tell me that it is made up. Beevor's book, to which you apparently (31st oct) and specifically (11th Nov) referred, concerning WW2 events in Berlin, I had a look at in a bookshop and read the latter bit. Maybe you have also seen the wikipedia summary of him, in which criticism of him is clear. All wars are atrocities so far as casualties and their relatives are concerned, both direct and indirect. Do you reject entirely the justification for the Red Army having entered Berlin because of alleged atrocities by some soldiers and maybe by some civilians against some women during the course of it ? Do you think that it would have been better if the Red Army had never existed, or that its role in WW2 was totally wrong ? War is a dirty business, whichever way you look at it. These questions are not just rhetorical, because the answers to them may well relate to what might be done from now on by Marxists and others. For instance, do you advocate the use of military force (when available) by revolutionaries for taking and maintaining power ? People of the world need to be clear about this. There is a saying that 'nazi is as nazi does' - the same applies to communists and everyone else. It's no good telling lies to yourself, let alone to other people. 'The Greek working-class movement from the 1930s to the present day' is the title of an excellent article in the November 2011 edition of the journal 'Lalkar'. It is on the Lalkar website. From the actual journal the article photocopied onto four pages of A3. I recommend the article to all interested in Greek politics. I think it is quite philistine to come out with arguments like what would you do if someone was pointing a gun at you. For war to be reduced down to this level is pretty pathetic. Besides, who is arguing that workers should have fought both 'sides' on an individual basis? And just for the record if someone was pointing a gun at me, with the intention to kill me of course I would shoot back if in the position. But how much does this tell us? Basically nothing in my view. Surely, the idea as communists is to fight against all reaction in a collective manner. To do what one can at the time given the circumstances. Sadly those fighting on any side were fighting on behalf of the state and in large part directly recruited by it. So far from it being a question of what would you do if someone pointed a gun at you. It is what is possible when you are forced to pick up a gun for the state and told to shoot other members of your class? p.s apologies for being a crass ('unofficial') sympathiser of the ICC. Although you didn't name names this is pretty insulting stuff. Though I do sincerely apologise for any offensive remarks by myself or anyone else in the past. I didn't name names as by definition I don't know who the various "anonymous" are (though apparently our webmaster can from their email address I don't know how to or want to). I also learned from Charlie that sometimes people post as "anonymous" not out of ill will but because the captcha is too difficult (I have suffered myself from this on other sites). I also meant the comments were crass (not the individuals, who I do not know) meaning that some people post comments which unintentionally actually make the ICC's positions look worse. 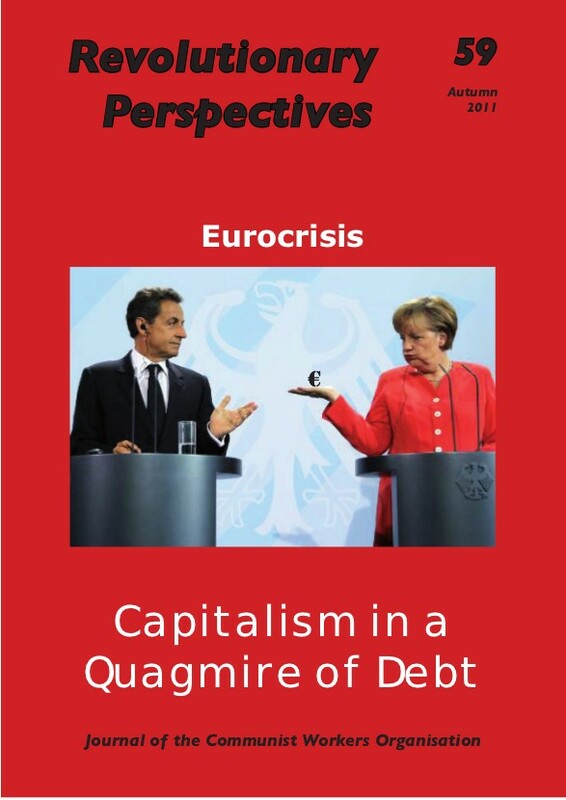 Revolutionary Perspectives 59 (Autumn 2011) is now out! 30 November: One off Protest or Working Class Reawakening? The Predictable Course of the Egyptian "Revolution"
Imperialist Manoeuvres in the Wake of the "Arab Spring"